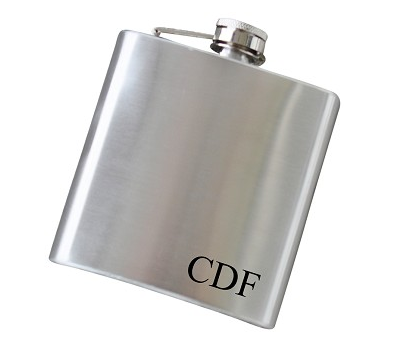 Add a touch of class to your gift with an engraved flask, specially designed by you. Whether it’s a birthday gift for a friend or a groomsmen gift for your best buds, a personalized flask is sure to be appreciated. Our high-quality flasks are made with stainless steel and hold 6 ounces of your favorite libation. With numerous customization options available, these flasks make perfect gifts for any occasion or celebration. A monogrammed flask can be a great way to say thank you, happy birthday, or as a token of appreciation for a friend or coworker. The selection of flasks we offer is affordable and stunning, ensuring your gift will be well received, no matter the reason. With choices of stainless steel, leather, or colors, you can custom create the perfect engraved flask for anyone and everyone. We also have a range of fonts and monogram styles to help you design the perfect look. Mix and match to suit your pals’ personalities and be the hero of the party! Aside from our great selection of customizable items, we also offer something many places don’t any more – quality customer service. With convenient online ordering and a friendly staff to help you along the way, ordering personalized items has never been easier. Our engraved flask options will help you create the perfect gift for any reason, even if it’s just for you! With maintenance-free etchings and quality craftsmanship, a personalized flask from Frederick Engraving will last for years. Place your order today and we’ll work fast to meet your deadline, all with the prices and options you’ll love!